I have been coaching for 31 years starting at age 23. I started at　False River Academy, other schools include St. Michael, Port Allen, White Castle, Donaldsonville, St. Martinsville and now　Oak Grove—-head coach at these schools. It is a calling and I was very influenced by my head coach, Coach Red Franklin. I attended Haynesville High School and I played football, baseball, basketball and ran track. I attended Louisiana Tech and ULM and I hold a Master’s Degree in Administration and Supervision and a plus 30 in Child Welfare and Attendance. I would name three players: Tony Joe Maranto (Port Allen), he was an All-American at Northwestern State, Jerome Peterson (Port Allen) played on the 1996 and 1997 National Championship team at Nebraska and Champlain Babin (Donaldsonville) played at McNeese. I would like to see us go to NCAA rules so we can block below the waist. I would put our brand of football against anyone and I think we have great players and great coaches. 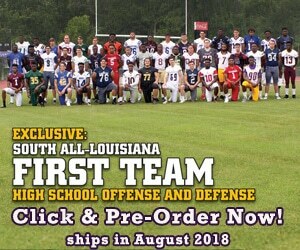 I don’t see alot of difference in philosophies in offense or defense between North and South Louisiana because of the Spread offense but　before that I would say there were some differences such as North Louisiana being more of an in your face style game. My favorite pro player was Dan Marino because he was ahead of his time and played with such great passion for the game. My favorite college coach was Barry Switzer when he was at Oklahoma because I loved how he related to his players and my favorite pro coach was Don Shula because he was truly a gentlemen of the game.